We’ve had a rough couple of weeks here at Weird Band HQ, so we were in dire need of some cheering up. And what better way to cheer up than with a little candy-colored, hyper-caffeinated J-pop? In J-Pop-Land, no one ever gets stuck in traffic, the serotonin flows like tap water and fluorescent is the new black. You know your favorite adorable kitten video on YouTube? Cram all five minutes of it down into a three-second animated GIF and you have the perfect visual accompaniment to most J-pop. All J-pop looks and sounds pretty strange to us Westerners, but the genre’s most freshly minted superstar, Kyary Pamyu Pamyu, takes things to a whole new level. She’s sometimes described as Japan’s answer to Lady Gaga, but it would probably be more fair to describe her as the majokko lovechild of Katy Perry and Psy. Like those two, her music tends to be polarizing (you either think it’s adorably catchy pop or annoyingly repetitive drivel), her dance moves tend to be varying degrees of ridiculous, and most importantly, her costumes and music videos tend to be garish eye candy explosions in which the cute, the comical and the grotesque intermingle in all sorts of head-scratchingly unexpected ways. You may prefer to watch Kyary Pamyu Pamyu’s videos with the sound turned down, but I bet you’ll watch them all the way through. 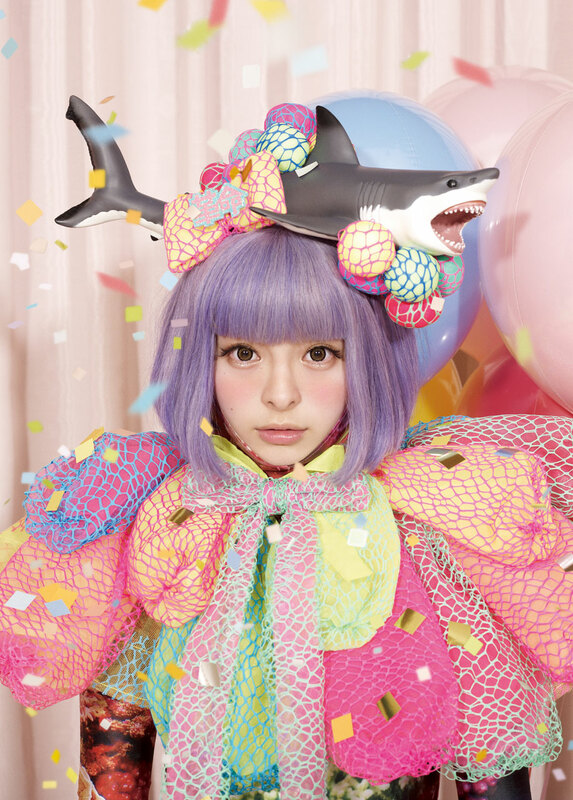 Kyary Pamyu Pamyu is a bona fide superstar in Japan; her first video, “PONPONPON,” has racked up over 50 million views on YouTube, which I’m pretty sure makes her the most popular artist we’ve ever blogged about (sorry, Flaming Lips; you had a good run). But popularity and weirdness are not mutually exclusive; over the course of “PONPONPON,” Kyary dances with a giant floating eyeball, pterodactyls and what appears to be a fat dude in blackface and a pink princess dress. And “PONPONPON” is probably her least eccentric video. In her most recent clip, “Ninjya Re Bang Bang,” she rides a giant carp, dances with cartoon robot mice and vanquishes an evil floating head by turning her arm into a laser cannon, all while wearing what we’re gonna describe as ninja sleepwear. Here, check it out, but be warned: This song will lodge itself in your head for days. We’ll leave you with “Invader Invader,” which both visually and sonically gets our vote Kyary’s for greatest and weirdest achievement to date. The finger-mustache dance moves, the breakdancing fur monsters, the TV-headed DJ, the completely gratuitous and totally awesome dubstep breakdown…why can’t American pop music be this much fun? Kyary’s latest album, Nanda Collection—which features “Ninjya Re Bang Bang” and “Invader Invader”—just came out in Japan and the States (not sure about the rest of the world). You can buy the digital U.S. version here . The reason American pop music isn’t fun any more is because both the performers and their fans take themselves far too seriously. “The music speaks to me!” you might hear some fans say. Right.